My favorite show, Dexter, has finally returned for its fifth season. Last night, the new season premiered with the episode, "My Bad," which begins moments after last season's chilling and incredible finale. As you may remember, at the end of last season, Dexter finally murdered "Trinity" (John Lithgow) after realizing that there was nothing left to learn from the veteran serial killer. Dexter made a lot of mistakes in his dealings with Trinity, especially getting so close to his family, and ultimately, interfering with their lives. But just as Dexter was about to celebrate his new kill, and take a vacation with his wife, Rita, and their new son, Harrison, he returns home to find that Trinity had already been there. Rita was dead in the bath tub, and baby Harrison was left crying in a pool of his mother's blood. In a scene similar to what Dexter experienced as a child, young Harrison witnessed his mother's murder. As an infant, it is almost impossible to know what he was able to process and what he will remember. As the new season begins, the police show up at Dexter's home to find him standing in the yard holding baby Harrison whose clothes are still covered in blood. As Debra arrives, along with additional police and paramedics, Dexter says, "I did it." Now, we all know that in this case, Dexter did not really "do it," but why would someone so careful and detached say such a thing in front of the police? I believe, at that moment, Dexter realized that he put his "dark passenger" ahead of his family. He had multiple opportunities to kill Trinity - out in the woods with an axe, at the construction site - but he backed off both times. He was consumed with understanding how Trinity could remain a killer for decades while still maintaining a (seemingly) happy home life and family. There was no real secret, it turns out. Trinity's family lived in fear of him; he was abusive, controlling, and violent with them. The happy family thing was just for show. But if Dexter hadn't been convinced that Trinity could be some form of mentor for him, Rita would still be alive today. More than any real feelings of remorse for his dead wife (Dexter barely has feelings anyway), it seems to me that Dexter is angry that his hopes for either being or appearing "normal" have forever been dashed. As much as he cares for his new baby, his two step children, and his wife, he is still a killer first and foremost. He could get caught at any time, and that revelation would destroy his family. Having a family did not stop the killing, nor did it make him more careful. Dexter really screwed up. He did "do it," to a real degree. Throughout the episode, there were flashback scenes to when Dexter and Rita first met and started dating. There were some sweet moments shown, but it was revealed that even a romantic dinner had a sinister motive with Dexter. On their first date, Dexter chose a restaurant frequented by his next target. When the target abruptly leaves, so does Dexter. He fakes a stomach bug and ditches Rita. It's truly amazing they ever had a second date! Yet they did, and it led to marriage and a baby. While at the funeral home, Dexter observes the grieving at a different funeral and knows he will never feel that way. It's not in his DNA. But he clearly feels incredible guilt (a new emotion), not just for the way Rita died, but for the way he treated her while she was alive. Dexter's colleagues at the Miami Police Dept. are clearly on his side (except for one). Lt. LaGuerta, clearly shaken up after seeing the crime scene, allows the FBI to handle the case rather than keeping it in house. This angers some of the cops as Rita was "one of their own." Though forbidden from working the case, Det. Quinn is suspicious of Dexter's behavior. He notes that his next door neighbor appeared to be more upset than Dexter about the murder. Dexter's behavior does raise alarms with others, too; but most chalk it up to shock. They simply will not allow themselves to believe that their co-worker could have killed someone. Same goes for Dexter's sister, Debra. She is worried that he could do something potentially self-destructive, and she tries to keep him focused. 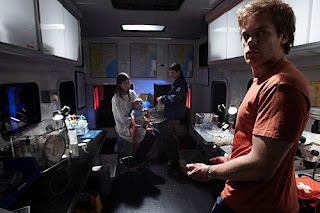 At one point, Dexter asks Deb to look after Harrison and to love him as a mother would. It was a weird thing to say that made it look a lot like Dexter was either going to kill himself or run away. Because of his "I did it," statement, the FBI wants to interview Dexter. It's standard to interview the husband after a wife dies, but Dexter's odd behavior raises other flags. He schedules, then skips, his interview. Rather than telling Rita's mom and the kids about the murder, Dexter wants them to have "one last fun day" without the knowledge. However, when he does tell them the next day, it looks suspicious and angers everyone. Astor is so angry that she tells Dexter that she wishes he was dead. The morning of Rita's funeral, Dexter is nowhere to be found. He left the baby with a neighbor, torched his storage unit, grabbed his knives, and took his boat out onto the water. Clearly, he was going to skip town rather than deal with his current situation. While filling up his boat with gas, he has a confrontation with some redneck in the bathroom. After telling him that he has had a "real bad week," Dexter murders this stranger in a very brutal fashion. At the same time, Harry appears for the first time in a while and tells Dex that was the "most human thing" he had done in days. 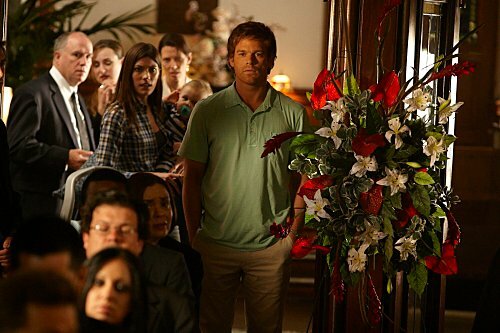 With that out of his system, Dexter goes to the funeral and delivers an eloquent eulogy for Rita. A few other things happened of note in the episode. For one, Quinn and Debra did it. Yep. Right there on the floor in Dexter's house. After cleaning up the blood from the bathroom, an emotional Debra busts a move on Quinn. Afterward, Quinn sees the next door neighbor and he asks him some questions about his interest in Rita. Suffice to say, Quinn's suspicions about Dexter were raised. They went even higher after hearing Dexter's emotionless, analytical 9-1-1 call to report Rita's murder. Another explanation is given for why LaGuerta is so upset about Rita. Turns out that Dexter went to the Court House to be a witness for the wedding of Angel and the Lieutenant that day. She figures it was at about this time that Rita was murdered. This could be key to establishing an alibi should Dexter need one down the line. In the preview for next week, the FBI is shown interviewing Trinity's family and hearing about "Kyle Butler." We also see Quinn continuing to pursue an investigation into Dexter and a relationship with Debra. Hmmm...will Quinn become one of Dexter's targets? Generally, Dexter won't kill cops, but he did in season two with Dokes (well, technically he didn't kill him). The Kyle Butler thing could be very damaging and nearly impossible to explain. Also, if you remember last season when Debra was investigating Harry's informants from back in his police days, she came across the true story of Dexter's mother. Though he already knew what had happened, Dexter listened intently as Debra revealed the whole story. Considering how Dexter witnessed his mother's murder and was left alone in her blood, I wonder if the similarity to Rita's murder will trigger any suspicion in Debra. Might spending time with Quinn, coupled with this revelation, cause Debra's faith in her brother to be shaken? Some interesting questions to consider. This season looks to be an emotional roller coaster as Dexter comes under increased suspicion. But what about his family life? What will happen to Rita's children? What about the baby? How can Dexter be a single parent and still deal with his "dark passenger"? There is a lot left to find out this season, as well as seeing who Dexter targets for murder (I'm not predicting Quinn as that is too obvious). I think we also have to hold open the possibility that it wasn't Trinity who killed Rita after all. Maybe it was someone else. Maybe it was the neighbor, who knows. With this show, I take nothing for granted. As with all previous seasons of Dexter, I am riveted and committed to finding out.